We the brethren and sisters met in convention Sept 20th 1881 and agreed to petition the following named minister Charles A. Taylor; Deacons J.R. Whitmire, Calvin Miles, Steaphin McCollum, John W. Curtis and J.N. 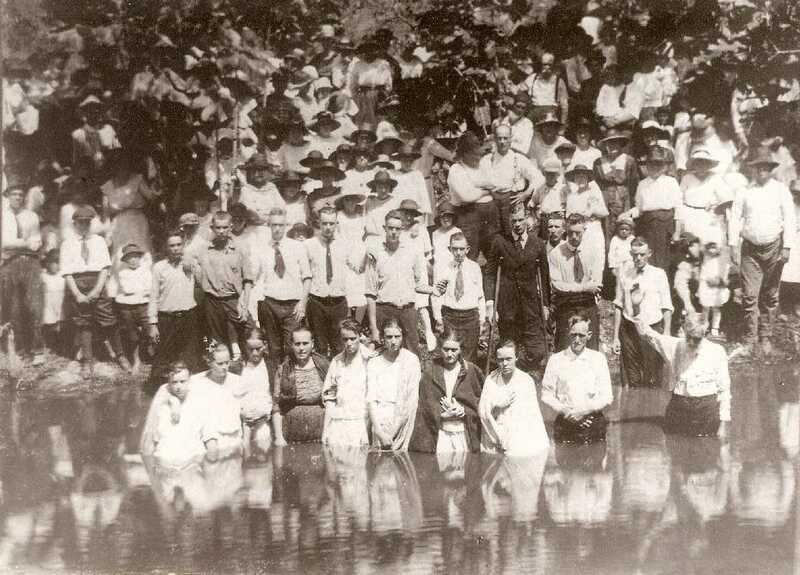 Curtis met by request of brethren at school house near George Wilsons on Saturday before the second Sabath in Oct 1881 and formed themselves in to a presbah organised by electing Charles A. Taylor Mod., John W. Curtis Clerk, and finding the brethren and sisters sound in the faith constituted them in to a church which was named Liberty Grove. The words written above were recorded by a group of Christian men and women when they began a church over 130 years ago---Liberty Grove Baptist. Located near Ashridge, the church still thrives today. The first minister was Charles Alexander Taylor, first son of John and Eliza Taylor. He was 47 years old at the time. Charles and his wife, Louisa Jane (Curtis), were the parents of eight children: George Washington, Amelia, Thomas P., Martha Jane, John Frank, James Jackson, William Verpo, and Lewis Monroe Taylor. All but the last son were born when Charles became minister. Early church rolls show many Taylor family members. Men listed were James Knox Polk Taylor, William C. Taylor, William C. Taylor, Jr., Alonzo G. Taylor, Francis Marion Taylor, and Carel Taylor, Women listed were Eliza Taylor, Patience (Taylor) Sutherland, A A Taylor, Georgeann Taylor, Nancy M. Taylor, Francis Taylor, Servaner V Taylor, and Emma Taylor. There are two photographs in the collection of Newman "Wayne" Taylor that reveal early events in the life of the church family. 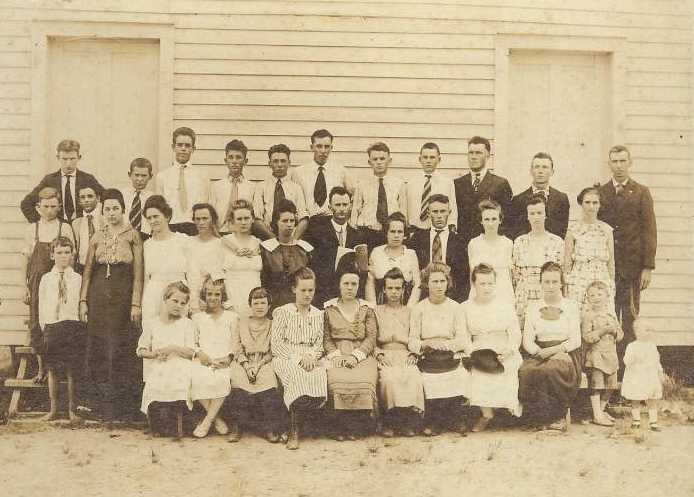 Singing class at Liberty Grove Baptist Church, in Winston County, July 1919. Verdie Davis with the song book was the teacher. 2nd row third from right is Lucinda Taylor. She and Verdie married later in life as second spouse for each. Photo taken about 1921 in Winston County, Alabama. Some of the known individuals are as follows: The Rev. Tom Kelly (hands raised) officiating, Alonzo Grant Taylor in the water with hands folded, Hardin Taylor (a son of Tom Taylor and grandson of Charles Alexander Taylor) with crutches. Right to left standing in the water to be baptized: Iren Roland (next to Alonzo) then Ida Brown, then an unknown girl, then Dovey Taylor (later Dovey married George Pulliam), then an unknown girl, then Dessa Crittenden. Right to left on the bank: crippled man being held by the arm is Johnny Harris (he was a school teacher), holding Johnny is Glenn Cauthen, next person unknown, then Wallace Taylor son of Alonzo, next is Howard Lovett, next is Bob Cauthen, behind Rev. Kelly's hand is Murphy Lovett, behind Hardin Taylors' left shoulder is Fayette Burns, behind Fayette is Newman 0. Taylor(a son of Alonzo), beside Newman to the right is Lucinda Taylor (a daughter of Alonzo), further to right is Thurlo Taylor (youngest son of Alonzo), and then Margaret Stevens Taylor (wife of Alonzo) with her hand on Thurlo's head. These persons were identified to Wayne Taylor by his father Newman and his Aunt Lucinda Taylor in 1978.